Go to Amazon DRS page , sign in if session is expired . You will be redirected to main page of DRS site. Read the instruction of DRS program Requirement if you want to otherwise skip them. Then you pass through two step process to set DRS. On 1st page register with LWA, paste security profile ID which is copied in step 1.Login With Amazon.Then in 2nd page you need enter SNS ARN topic ID and click to next button. Next page is where you need to add products , remember add similar or same category products in same slot so that customer can have maximum number of options to choose of them. If you are only one product manufacturer then add products on basis on quantity or quality. To add products it needs ASIN(please refer this website to know more about ASIN).Go to Amazon , click on the product which you want to add in slot. At the bottom page of product you will see Product details , in that description you'll notice ASIN , copy that number and go back to DRS device setup page and paste it. Same product will be filtered in results then click on add button to pass it in slot. After that Click on next to complete DRS device setup. Note: copy Slot ID and Device Model ID. Three programming languages I have used in this project , HTML , Node JS and Arduino. In flow chart HTML page is created where user do Login with Amazon.Every action/event such as checking device status and de-registration etc is done through socket.io npm library in node js. MCU used to check availability of snacks in vending machine through counter index. Each time when snack is purchased its counter value will get decreases by 1 . This counter index is updated through serially to node js , Using threshold level check in node js Dash Replenish service will be called. 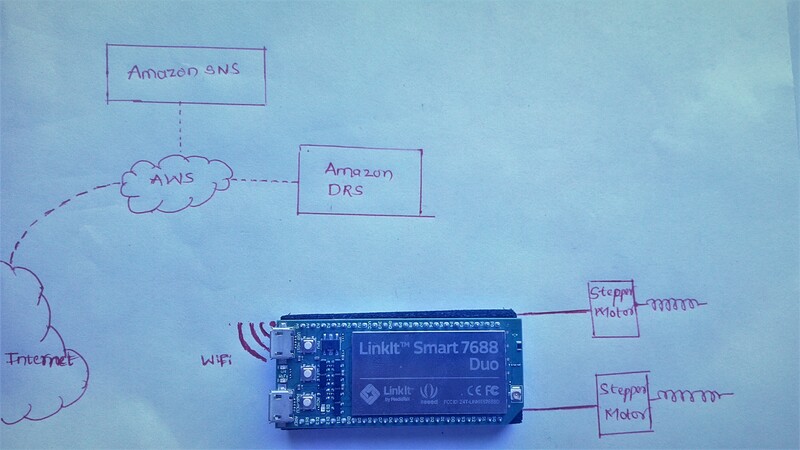 I used MediaTek 7688 Duo which covers all of above units it has MPU MT7688AN which supports Node JS , HTML which I need most and MCU ATmega32U4 which supports Arduino so all in one tiny package, I Loved it and it suitable hardware especially things get it done like Dash Replenishment Service. To explain with flow chart which i have mentioned earlier, I have created small HTML page where you have do LWA(Login with Amazon ) process for first time, then another page for content filling which is very useful in my case where Vending machine has to Re-fill products once all orders from Amazon. So it difficulty to pass values from Web UI , where vendor gives number inputs , directly into Arduino code and assigns respective count for it. That's make very easy with Node JS on MT7688AN MPU platform on as it takes input from Web UI(HTMl page ) through socket event and writes it through serially to ATmega32U4 Microconroller. I have made only one vending machine slot to demonstrate working of Amazon DRS . I bought a solid 0.5mm wire and made winding over bottom to gain shape of actual spring look. With small errors and bending finally spring look like shape.Then I took packaged cardboard and built into machine slot like shape. To subscribe products through Amazon DRS on behalf of Vending machine Re-filler/Retailer. Customer must to go through Login With Amazon(LWA) process.Which is one time signup/signin with Amazon DRS and Vending machine Retailer also. Then it will redirect through product page in slot wise. After choosing products , which customer/vending owner wish to order automatically, he/she will get notification of products subscription. So in my case there is main HTML page on which I have Login With Amazon button by clicking on it above mentioned procedure will be followed.At the bottom of page there is Re-fill button which is mainly for entering count/quantity of predefined products in that small pop-up page. Remaining buttons to check slot status , Device Status and Subscription status. After LWA, Authorization code is generated to from index_testing.html page passed through socket event into MediaTek_DRS.js. With this Authorization code request is to Amazon to get access token and saved it in predifined variable so that it will be used to call DRS Replenish API. ( Amazon uses OAuth 2.0 frame work, which is explained here. An access token is an alphanumeric code 350 characters or more in length, with a maximum size of 2048 bytes. Access tokens begin with the characters 'Atza |'. Access tokens are only valid for sixty minutes and are specific to the user logging in and the data the app requested when it triggered the login. When you receive an access token, it is as a structure in JSON format with three pieces of information: the access_token,the token_type, and expires_in (the number of seconds before the token expires).